The cross stitch is very easy to make in crochet. The stitch is made by skipping a stitch, working into the next stitch and then coming back and working into the skipped stitch. 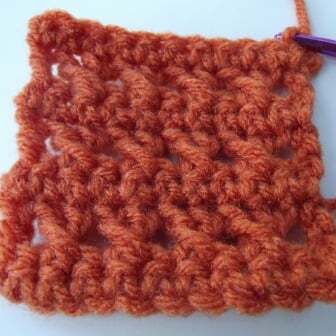 It can be made with the half double crochet, double crochet and triple crochet stitches. For this tutorial I will show you how to make it with the double crochet only, because the concept is the same for the other stitches. The beauty of this stitch is that it not only creates a nice lacy design, but it also leaves you with a beautiful texture, especially on the right side of the fabric. 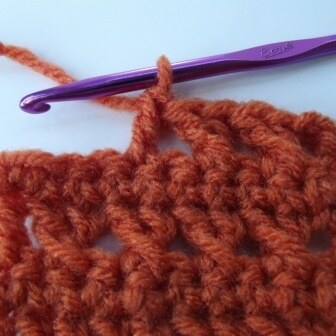 After you skip a stitch you can actually crochet more than one stitch before you back track and crochet into the skipped stitch. For a tutorial on that, click here. To make the stitch, simply skip the next stitch. 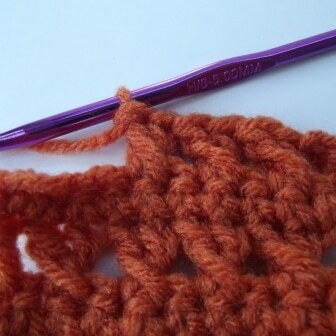 Then double crochet, half double crochet or triple crochet into the next stitch. Skip the Next Stitch and DC into next stitch. Now back track and crochet into the skipped stitch.